It seems that I write at least one post every year explaining just how ugly that season’s AUCNFFC (BTYBB) has turned out. But this year, the Eleventh Annual Uncle Crappy NCAA Final Four Challenge (Brought To You By Bocktown) seems to be, uh, extra special. How special? Only one of us — one, of the 28 who entered — has a chance of picking the correct title game. Twenty of us have earned all the points we’re going to earn. And 12 of us — 42 percent, by the way — who make up this year’s class of Blutarsky Award winners. And now, the moment we all await each March: The naming (and shaming) of our Blutarsky Award Winners. For those still alive, I’ll take a look at the possibilities for future scoring and post something later this week. And for the rest of you: thanks for playing. I hope you got your money’s worth. The Flyers are pumped. Thanks to @calipanthergrl for the pic. I cringed as soon as I saw the announcement. 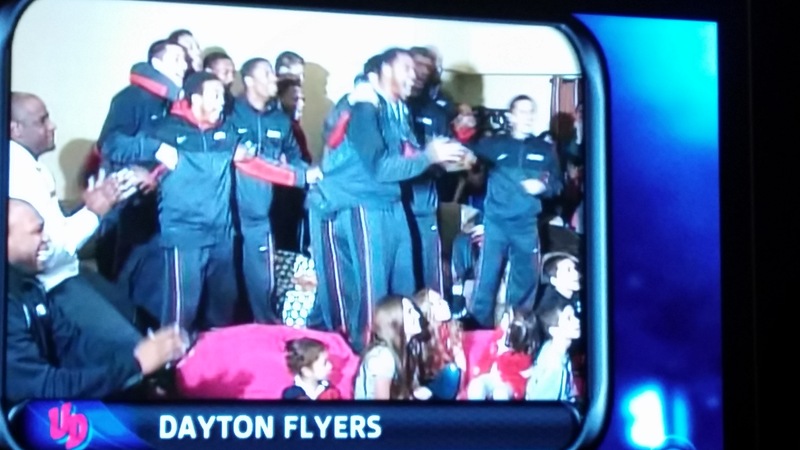 Ohio State vs. Dayton in the first round of the tournament. Ohio State has no consistent scoring. Ohio State had a weak finish to its season. Ohio State may not be especially interested in a first-round game against Dayton, a team that will definitely be interested in beating the state’s biggest and best program. Classic trap game, in every way. I haven’t decided how I’m going to pick this one — but I could very easily pick the Flyers to win. Which, of course, means I’m probably totally wrong, and you should pick Ohio State to win the whole freaking thing. And that, boys and girls, brings us to our now-daily reminder: Registration for the Ninth Annual Uncle Crappy NCAA Final Four Challenge (Brought To You By Bocktown) is open for just about another 24 hours. Entries are coming in at a steady pace, but it’s looking like we’re going to have a smaller-than-usual field this year. And that means the odd of you winning a $30 Bocktown gift card are better than ever. Full rules and guidelines? You’ll find those here. But remember, it’s free and it’s easy — I need only your final four, championship game teams and eventual champion (plus a predicted title game score, to serve as a tiebreaker). I had fun this morning, posting a stream of dumb Michigan jokes on my Facebook page. I had fun for a bit in the third quarter, when it looked like Ohio State’s defense had settled down and the offense would continue scoring on most of its possessions. The first half of the Michigan game? I’m not sure I’d call that fun. Fourth quarter? Fun, in a masochistic sort of way. Michigan’s two-point conversion attempt? If relief equals fun, then sure — fun. I’m proud that Ohio State found a way to win a game that it shouldn’t have today. But there is a lot of stuff to figure out before Saturday’s title game against Michigan State — overall passing defense, defending screen plays, improving the consistency of our passing game. Oh, and maybe how to not throw punches at members of the opposing team. But. That’s two in a row over Michigan. That’s a rivalry-game win on the road. That’s the nation’s longest undefeated streak. And that feels pretty good. Speaking of fun: Did you catch the end of the Auburn-Alabama game? That upset could — should? — open a door for Ohio State that as recently as a few hours ago looked to be deadbolted, barricaded and boarded up. No undefeated major-conference team has ever been jumped in the BCS rankings by a one-loss team. If going undefeated was easy, there would be more than two AQ teams to do it this year. As a response to the “Ohio State Doesn’t Belong” Chorus that has already started: Ohio State was favored today by 16.5. Alabama was favored by 10. We play the games for a reason.